This is the first in a two-part interview with two much loved sisters from the Muslim Community - Nye Armstrong and Rebecca Minor. They will be sharing their reflections on Ramadan before and after they became Muslim and then later in the week they'll be discussing their exciting new charity project Water For All with charity: water. Nye is a graphic designer based in Connecticut who runs a successful youtube channel where she shares her life, faith, and passions; and encourages her viewers to learn and grow along with her. She also runs a website called Andirun Designs where she sells her original designs, including mirrors, badges, and jewelry. Rebecca is a special education teacher who writes an informative and uplifting blog called A Minor Memoir and often features in Nye's videos. She shares her passion to learn more about Islam, to educate others, and shares her enthusiasm for life and being the best person she can possibly be, for the sake of Allah. For many new Muslims, Nye and Rebecca are the warm onscreen presence which has reassured and encouraged them as they began to learn about Islam. Their warmth and friendship on screen is wonderful to watch. Rebecca's glowing smile and Nye's infectious laughter have been responsible for brightening up many a dreary day. Each video is a virtual hug for anyone who has felt lost or discouraged in their faith. Together they have presented incredibly helpful youtube series on prayer, the Sunnah, and Ramadan. What was your opinion of Ramadan and Muslims before you converted? [Nye:] I honestly didn't know much about it. 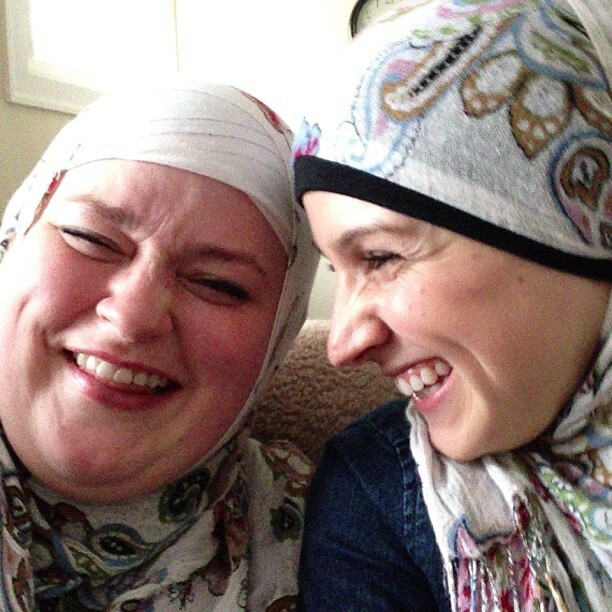 Until I met my husband I didn't even know what Ramadan was or what religion celebrated it. It was completely off my radar. After meeting Hassan I knew they went without food and drink, but didn't look any deeper than that. Then one year, I began to fast with Hassan to give him support during Ramadan. While on that journey I vlogged about what I learned and posted it online. I had an amazing response from people who wanted to help me. And by the end of my first Ramadan I knew I was on the path of becoming Muslim. 3 months later I took my shahada [declaration of faith]. Alhumdulillah. 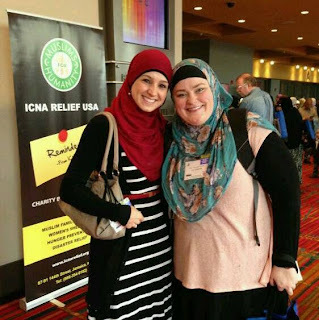 [Rebecca:] The first time I heard about Ramadan or met Muslim people was when I was working as a Resident Assistant at the University of Connecticut. Two of my coworkers were Muslim. I didn’t think much of it at the time. Given that the RA’s were upperclassmen living in freshmen dorms, it was common that we would eat meals together in the dining hall. I clearly remember wondering what happened to my two coworkers and why they had stopped eating with us. Once I was able to find them to ask, they explained that it was Ramadan and that they weren’t eating until sunset. During the next two years as I was asking more questions and learning about Islam, I decided to fast with them. How has your relationship with Ramadan changed since your first Ramadan? [Nye:] This is my 4th Ramadan. I would equate each passing Ramadan with the gradual opening of a rose bud. The first three were all about the fast. Tight and limited. That is all I thought about. I don’t think I could have handled more. But this year Ramadan is blooming before my eyes. Aspects of the Quran and my faith are being shown in a new light. It is amazing. So much of this change has to do with how I use my time. I am donating my time to amazing causes, working with friends, spreading dawah, learning more about the Quran, and the list goes on and on. This year is the first year I can honestly say I will be very sad when Ramadan ends. The years before it was said while running to the finish line. This year I will be dragging my feet. [Rebecca:] It’s hard to believe that this is my 7th Ramadan. I hadn't realized so many years had gone by until the question was brought up at a recent iftar for converts/reverts. There were people who were fasting for the very first time as well as those who had been fasting longer than I've been alive. As I said earlier, I observed the fasting during Ramadan for two years before taking my shahada. During this time, I was beginning to learn about Islam. The first two years of fasting for Ramadan helped me connect with what I was learning and become more secure in my new found beliefs. This still holds true today. I’ve found that I start looking forward to Ramadan earlier and earlier each year. I no longer view Ramadan as giving up food or water but as a chance to see what I am capable of. Every year at the end of Ramadan, I find myself in awe of what I was able to accomplish - standing in prayer for hours each night, giving up foods and sweets that I normally wouldn't be able to resist, spending more time praying for others and reflecting on what I want to do with my life and how to become a better person. I see Ramadan as a reset button. If I can pray taraweeh for an hour and a half every night during Ramadan, I can stand for a few rakkat of tahujjud. If I can read the translation of the Quran in its entirety during the month of Ramadan, I can make time to read one page each day. Ramadan has changed from revolving around giving up food and drink to being a time in which I realize my potential and finish the month with a stronger drive and clearer purpose. Have you established or taken on board any Ramadan traditions? [Nye:] Not really. In the years before I focused on the food, really big elaborate meals for hubster and I. Right now with our schedules being so out of sync, our lives feel more transient than grounded. I will say I have been to more events/iftars this year than I have in the past... which is really nice. The one I have been somewhat consistent with is trying to make online content that helps new Muslims like me feel welcome when they convert to Islam. [Rebecca:] One of the traditions I look forward to most about Ramadan is hosting iftars. I love being around people. I love food. I have also recently discovered a love for cooking. I’m also well aware of the blessings one gets from feeding those who have been fasting. That being said, I have made it a point to invite those I love and those who might otherwise be breaking their fast alone to come and join me. It’s a tradition I really love and hope to continue, inshAllah. How does Ramadan affect your interactions with others - Muslim and Non-Muslim? [Nye:] One of the best feelings of Ramadan is the sense of community. Even when I am alone in my apartment I know people are fasting, praying, trying to connect with God. That is amazing to think about. We are all focusing on a common purpose. I love being around other Muslims during Ramadan, it feels like a family reunion. I also try not to argue with my husband. If it is starting to look like one is a’brewin’, I just step back and stop talking. I usually confront any issue right away. Ramadan lets me keep an even keel and learn that some issues don’t matter at all. And as for non-Muslims... it is very hard to be around people who swear constantly. It wears me down emotionally. InshaAllah my situation changes and I won’t be surrounded by this type of language for much longer. Please make duaa for me. [Rebecca:] Ramadan unites me with my Muslim community. Alhamdulillah, I’m part of a really wonderful and active community here in Connecticut. While I get the chance to see and interact with many people throughout the year, it is during Ramadan when I feel an even stronger bond. It’s refreshing and exciting to see familiar faces at masjid iftars and to see my friends’ children and how they've grown. There’s a sense of comfort, standing next to the same people in prayer each night. Ramadan strengthens the bonds of brotherhood and sisterhood and makes me realize how blessed I am to be a part of such a wonderful community. Don't miss Part 2 of Nye and Rebecca's interview on Sunday evening! In the second video link of the day, Nye and Rebecca explain many common Islamic phrases in their video: What Are We Saying? ?